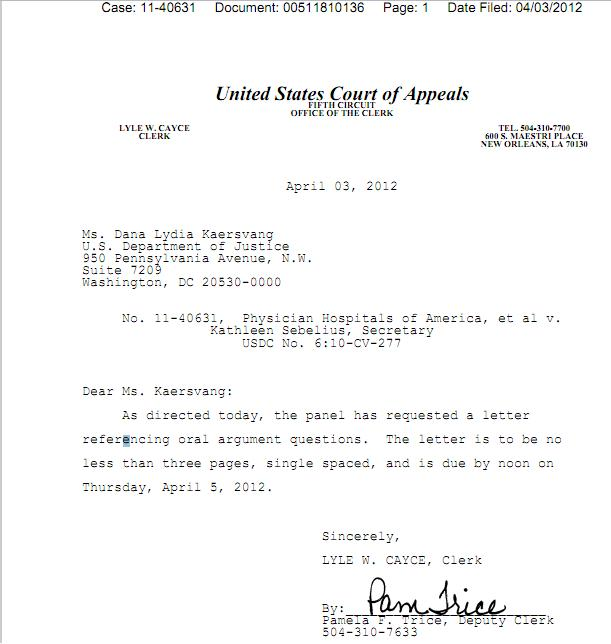 The order, by a three-judge panel of the U.S. Court of Appeals for the 5th Circuit, appears to be in direct response to the president’s comments yesterday about the Supreme Court’s review of the health care law. . . . The panel ordered the Justice Department to submit a three-page, single-spaced letter by noon Thursday addressing whether the Executive Branch believes courts have such power, the lawyer said. Smith then became “very stern,” the source said, telling the lawyers arguing the case it was not clear to “many of us” whether the president believes such a right exists. The other two judges on the panel, Emilio Garza and Leslie Southwick–both Republican appointees–remained silent, the source said. I believe the written order is here (thanks to reader Jason Walta for the image). The assignment was given orally, so it is not written into the written order. The oral argument hasn’t been posted yet, but when it becomes available, it will be here. If this story turns out to be accurate, it strikes me as extraordinarily embarrassing to the federal judiciary. But I want to hear the oral argument audio first, or at least get some more confirmation as to what happened, before reaching a firm conclusion. Given that this seems to answer the panel’s questions, I would think it provides a change of circumstances justifying withdrawal of the order, however justified or unjustified it may be. ANOTHER UPDATE: Having heard the audio, the tone of the questions was quite different from what I was expecting based on the story. It came off to me as earnest and genuine, not just an effort to score a cheap political point. With that said, the order still strikes me as highly inappropriate: The DOJ lawyer was quite clear as to DOJ’s position, and lower court judges deciding cases based on briefing and argument should not be going outside the record to come up with assignments to litigants based on press releases by politicians in such politically charged matters. It just makes the judges look like political actors themselves, which doesn’t help anyone.